The programme started well enough with ‘cat scientists’ (really?… and if so I want to be one.. where or what do I study?) arriving into a very pretty village in Surrey. We got images of cutesy rose covered cottages, a village green, and the centre of operations, Cat HQ was the local village hall. All very ‘Vicar of Dibley’. By now my tea was drained and my bun polished off and I was getting a bit antsy. This was all very nice…. but WHAT IS THE SECRET LIFE OF THE CAT? 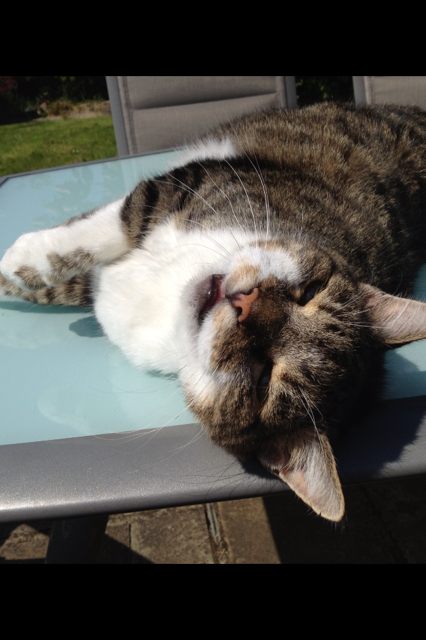 “The Secret Life of the Cat” he seemed to say…. which bit of ‘secret’ don’t you get? As I tried to contain my disappointment I had a picture of the little village in Surrey now abandoned by TV Crews and Cat Scientists, its Village Hall returned to its original use. In my mind’s eye I see a moonlit, midnight gathering of cats on the village green. Tails up, purring contentedly… and just faintly I am sure I can hear something else. Yes.. the cats are laughing. Cat Scientists indeed…. I think TS Elliot had it right in his wonderful poem, The Naming of Cats. Hi Barbara– Yes, indeed, I know my Katie Cat has lots of secrets going on inside her little head. Cats are very mysterious. I didn't see the programme but twitter was going mad about it. I love your thinking of all the cats getting together and saying,right the camera crew have gone now lets get back to what we usually get up too. You said it all, Barbara, and you are so right. Those of us who love our moggies know it's impossible to classify them. The thing that surprised me was that the cats in the experiment were fitted with rather large and cumbersome cameras and tracking devices and they didn't seem to mind. The experiment must have cost a fortune and was it worth the money? I don't think so. I would love to fit a camera to one of our cats, who spends WAY more than 20% of her time away from home. I want to know which neighbours are feeding her. We have her on a strict diet but she's still the size of a house.